This is Missouri's premier whitewater run. Probably 80% of the whitewater paddling in Missouri occurs on this section of the St. Francis River with the other 20% taking place either on the Upper St. Francis, on the whitewater creeks close to the St. Francis, on the Mississippi River Chain of Rocks at St. Louis, or at park-and-play spots around the state. The reason for the uniqueness is simply a matter of geology, i.e. the St. Francis River is the major drainage for the St. Francois Mountains, the highest part of Missouri's Ozark Plateau. The granite riverbed and mini-gorges, geologically termed “shut-ins,” of the St. Francis and its tributaries are in stark contrast to the gravel-bed float streams for which Missouri is famous. First-time paddlers, who may be familiar with the placid float streams, will be pleasantly surprised to find some real whitewater in Missouri. It's not the Rockies or the Appalachians but, hey, we're only 100 miles from St. Louis! From the put-in at the beginning of a beautiful granite gorge (Tiemann Shut-ins) in Millstream Gardens Conservation Area, the action begins right away with the river dropping 60 feet per mile through four major drops known as Big Drop, Cat's Paw, Double Drop, and Rickety-Rack. Numerous play-spots abound and, on a warm sunny day when the river is up, rock lizards (a.k.a. resting paddlers) are common. Downstream from Rickety-Rack, the river briefly mellows and the paddler encounters a high bluff on the right, signaling the mouth of Mud Creek just ahead. After about a half mile of slow water, Turkey Creek enters on the left at Turkey Creek Picnic Area, part of the USFS Silver Mine Recreation Area. The river makes a sharp bend to the right and small rapids, interspersed with willow jungles, are found on both sides of the gravel bar that splits the flow. At the end of the willow jungles, the paddler enters the pool formed by the Silver Mines Dam, a remnant of long-ago mining activity. A breach blown in the left side of the dam provides a route at low to medium levels. However, when the river is near or over D bridge (Roselle > 6ft), the breach in Silver Mines Dam forms a dangerous hole that just keeps getting bigger as the level rises. When the river is high enough for the entire dam to be covered (Roselle > 8ft), the extremely hazardous pourover is best viewed from the portage on river-right. Downstream from the dam are several small rapids, including Little Drop and Fat Man’s Squeeze, which continue until the take-out at the low-water bridge in the USFS Silver Mines Recreation Area. A trail follows the entire length of the run (river-left) from the put-in at Tiemann Shut-ins parking area to the take-out at the low-water bridge in Silver Mines. Spectators and boaters wanting a visual of the run frequently use the trail. At certain levels, some people paddle down to Double Drop, play for an extended period, paddle back up to Cat’s Paw, and walk back to their vehicle on the trail. Boaters wanting an aerobic workout prior to paddling can drop off their gear at the top, drive to the take-out, and run along the trail (about 2.5 mi) back to the put-in. Access to both the upper and lower St. Francis is off highway 72 west of Fredericktown. At low to medium levels (0 to 20” on D bridge), most people just paddle the lower St. Francis. However, at higher levels (near or above bridge level), some will do both sections and some will do only the (easier) upper section. The generally accepted meeting place for paddlers is a parking area adjacent to the low-water bridge in the USFS Silver Mines Recreation Area. This parking area is the take-out for the lower run and is located on a spur road off highway D. Boaters meet here to check the gauge on the low-water bridge, to set up shuttle, and to socialize. The MWA Message Board frequently has posts about planned meeting dates and times for paddling. To get to the take-out from Fredericktown, go west on highway 72 about 4½ miles past the highway 67 intersection and turn left (south) on highway D. After going about 2½ miles, you'll crest a hill and see the St. Francis floodplain and bridge in the distance. At the bottom of the hill, turn right on the spur road (identified by USFS camping signs) and go straight to the take-out parking area. Two comments about this route are worthy of note: (1) Several boaters have gotten speeding tickets on highway 72. Set the cruise control on 55 mph to play it safe. (2) Highway D is narrow, curvy, and hilly, but it is also paved and, consequently, very tempting for excited paddlers to go too fast. Please drive reasonably on highway D and don't scare the hell out of the locals. The put-in for the lower run (take-out for the upper run) is in Millstream Gardens Conservation Area. To get there, take highway D back to highway 72 and turn left (west). Go 4 miles on highway 72 and turn left (south) at the sign for Millstream Gardens. Go about 1 mile, passing a left turn to handicapped parking area, to the next left turn and go ½ mile to the parking area and pavilion that overlooks the Tiemann Shut-in section. Going straight at the last turn would take you to an upstream access (Fishermans) that is at the top of a half-mile long pool. Most people go to the pavilion parking area, however those wanting to paddle some flat-water before the good stuff can put in at Fishermans. The put-in for the Upper St. Francis is where highway 72 crosses the river, 6 miles west of the highway D intersection and 2 miles west of the Millstream Gardens turn. Use the Roselle Fishermans Access entrance, located west and south of the bridge. 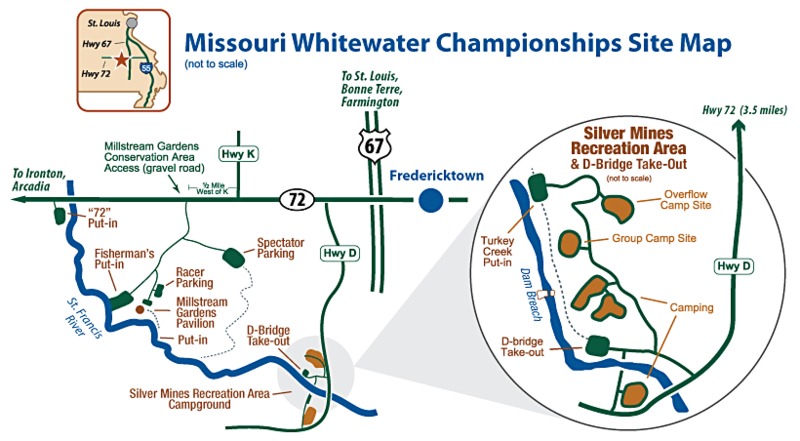 The Missouri Whitewater Association (MWA) sponsors a slalom race on the St. Francis at Millstream Gardens every spring. Click on the Missouri Whitewater Championships for more information. The MWA also sponsors a beginner/intermediate whitewater clinic on the St. Francis in the spring. Students are taken in small groups down class II-III sections of the river and based upon their skill level, taught various skills including river-reading, playing and safety. The River Gypsies’ Guide to North America by Leland & Andria Davis (Brushy Mountain Publishing, Inc) has an outstanding description of the run. A Canoeing & Kayaking Guide to the Ozarks by Tom Kennon (3rd edition, Menasha Ridge Press)is an older, but still good, resource. Also see AW Journal Articles about the St. Francis. "Multiply" method (simple, but limited in application): Several people have noted that when D-bridge level is less than about 36", the level each succeeding day is a fixed fraction of the level the previous day. If a 2/3 multiplier is used and the level is 30" one day, then it's projected to be (2/3)30 = 20" the next, (2/3)20 = 13" the next, etc. "Hydrograph" method (greater applicability, but requires archived hydrographs): This method uses graphs and tables from the web page USGS Roselle gauge. In essence, one is predicting the future behavior of the river based on past hydrographs. After going to the web page, note that the default output format is "graph" for a "7-day" time period. Change that to 31 days to see if there have been any hydrograph peaks in the last month. We'll assume there has been at least one and that the level peaked and dropped in a smooth curve thereafter. Change the output format to "fixed-width table" to see tabular data for the level at different times of day. Using an Excel spreadsheet, you can archive the graph and the table so that after a future rain event you can predict the level based on how the river dropped in the past. For generally better results you'll need to archive several hydrographs for different rainfall patterns and ground moisture content.